This quick and easy recipe contains whizzed tomatoes and chestnut mushrooms and the addition of kalonji seeds and chili powder give a delicious kick. 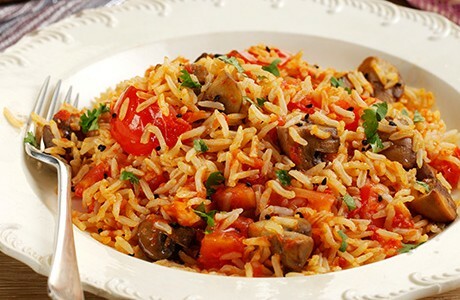 Wholegrain rice ensures this dish is healthy as well as delicious. Cook the rice as per the instructions and set aside. Heat half the oil and fry the whizzed tomatoes for 5 minutes, then add the chopped tomatoes, the kalonji and the chili powder. Heat the remaining oil and fry the mushrooms on a high heat for 10 minutes until golden brown. Mix through the tomatoes and cook for a further few minutes. Add the rice and season, then stir well and heat until piping hot. Scatter over the coriander and serve.